Recently I helped a client set up FreePBX Endpoint Manager. For the uninitiated, Endpoint Manager is a commercial plugin for FreePBX that allows automatic provisioning and configuration for supported VOIP endpoints. For a high-level overview in plain English, this allows you to configure phone settings from the PBX interface, then simply plug in your phone and power it up — and it will auto-magically configure itself and be ready for use: be connected to the phone server, assigned to the correct line, have BLF keys set up — the whole works. This can be extremely helpful in large installments where there are more than a handful of phones; instead of logging into each phone’s web interface individually, once your homework is done you basically plug phones in to your network, let them configure themselves, and then go ahead and start using them. Plug in the phone and let the magic begin! Obviously that’s a pretty general overview. But there’s one more piece of the puzzle that needs to be in place first for this all to come together, and that detail is the focus of this post. When you plug your VOIP phone into your network, how is it going to know which address to reach out to for instructions? In other words, how will it know where the PBX is? The answer lies in DHCP option 66. 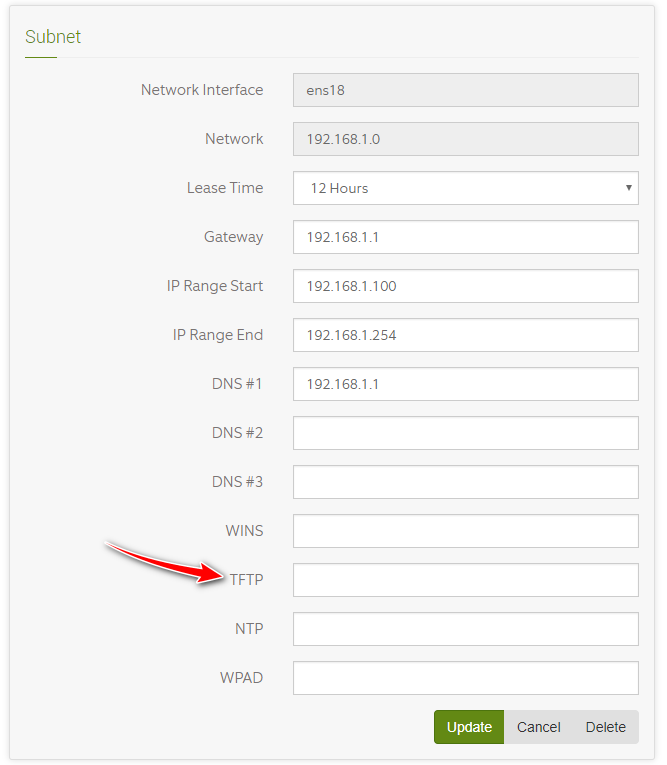 Option 66 allows you to specify the address of a TFTP server on your network, which is how Endpoint Manager serves configuration files to phones. So basically you need to add a DHCP configuration setting specifying your PBX server’s IP address for option 66. Many routers should be able to support this, so check your documentation; or if you’re using a Linux-based router with dnsmasq, read on! I recently configured DHCP option 66 on a ClearOS 7 gateway / firewall. If you’re not using ClearOS the file names shown below might be slightly different, but any Linux distro using dnsmasq as DHCP server should be very similar to this; so if you understand the concept, you should be able to adjust this as needed for your own router. Now, ClearOS’s DHCP settings are managed via its webconfig interface. Setting these DHCP options is not possible via the GUI (graphical user interface), so we need to head to the command prompt. (see “facepalm conslusion,” at the end of the page!) The dnsmasq config files are in the /etc/dnsmasq.d/ directory. From our look into the webconfig-generated file, we know the interface name is ens18. This knowledge will be useful shortly. That tells us that configuration directives found in any file found in the /etc/dnsmasq.d/ directory will be included when the dnsmasq service starts. So all we need to do is create a file in that directory, giving it any name we wish, and place our custom DHCP option line in our new file. In this case we’ll make a new file and just name it pbx. With this done, and your homework done on the PBX, you can power up your VOIP devices; and the DHCP server will tell them where to find the TFTP server. The phone then queries the TFTP server (your PBX) for further instructions; and the phone server’s endpoint manager responds by handing out the configuration file relevant to the MAC address of the device that’s requesting it. Your phone downloads the information and applies it — and, at least in the case of Yealink phones, reboots itself — and you’re good to go! There’s a TFTP setting lurking (smirking?) in the ClearOS DHCP settings page! All right, so a couple takeaways here. First of all (note to self), never presume anything! Second, if you run ClearOS, option 66 for TFTP server specification is right at your fingertips; so if command line navigation looks scary to you, or you don’t have root shell access, go ahead and sigh in relief. Third, little nuggets like this are fun to learn so I don’t regret at all that I took the long way around. Since the information in this post may be helpful to someone, I’ll publish it even though it may seem a little superfluous. Till next time… keep learning!